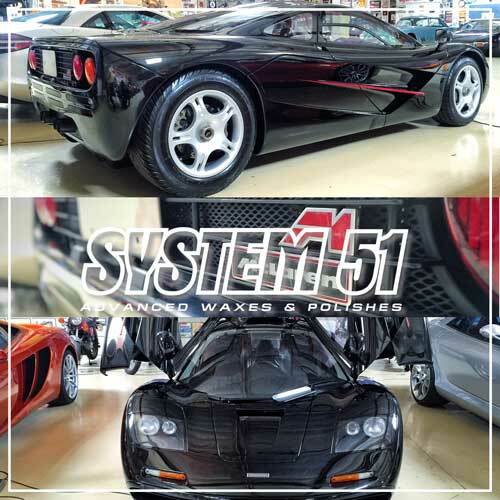 System 51 has been family owned and operated since 2004 and has built its reputation on offering eco-friendly technologies and products that simplify the once-monotonous process of surface refinement. 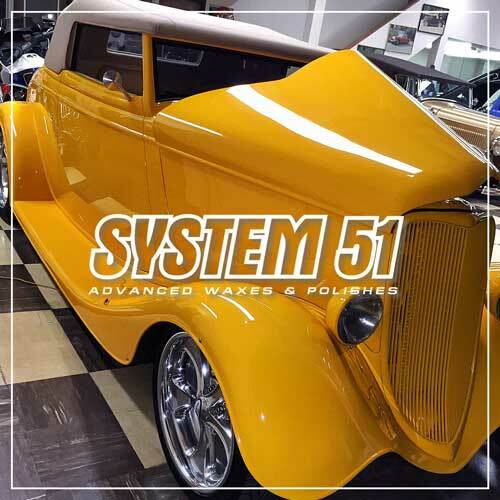 Feedback from industry professionals and changes in surface coating technology illustrated that there was a demand for a higher standard in compounds, polishes, waxes and chemicals that the current “industry-standard” options were not meeting. 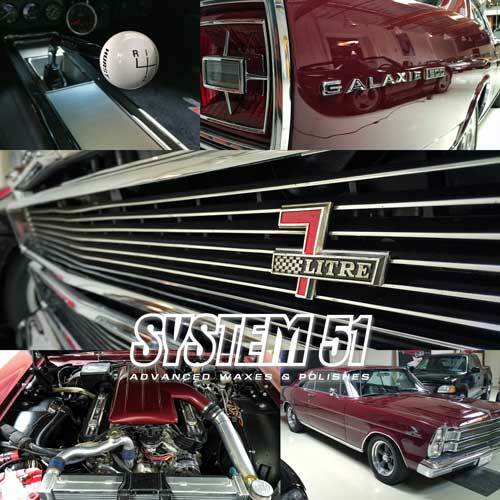 System 51 was able to rise to the occasion and usher in a new era of surface care products. 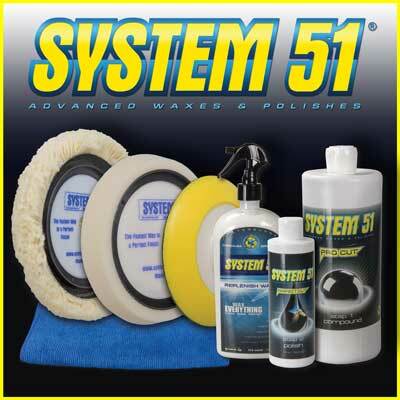 Utilizing our proprietary waterborne technology, System 51 products have been scientifically formulated to deliver unrivaled results on nearly every surface. By excluding harsh petroleum or solvent-based chemicals, many of our products are non-reactive and safe for surfaces in multiple industries. 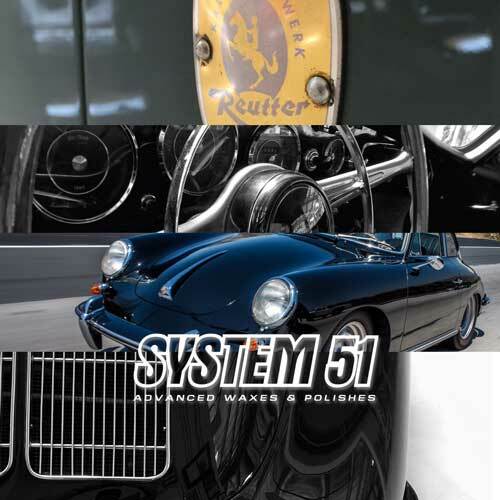 There are no fillers or silicones to mask or hide surface imperfections, which means from automotive, to marine, aerospace, to manufacturing and beyond, System 51 products provide versatile solutions to your surface refinement and protection needs. 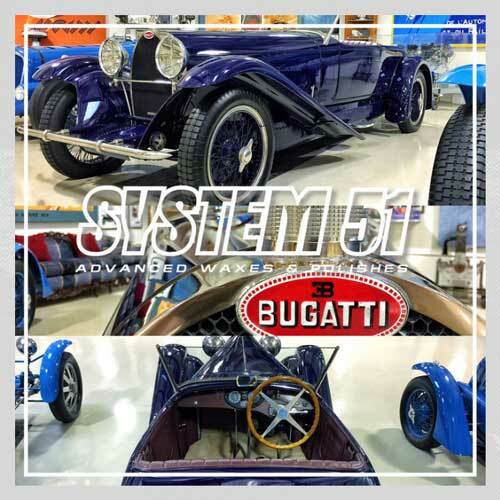 System 51 is committed to providing the highest levels of service, quality manufacturing processes, as well as developing cutting-edge surface refinement and care products that continue to meet the demands of industry professionals and at-home enthusiasts alike. 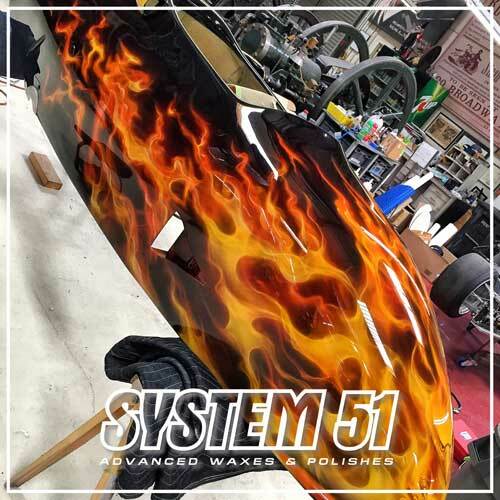 Whether you’re color sanding to remove surface texture/enhance shine, trying to fix major clear-coat defects (scratches/gouges) or remedy minor issues (spider-webbing/swirl marks), System 51 has a compound or polish to meet your needs. Our micro abrasives allow you to achieve a true, optically pure finish with minimal effort and easy clean-up. Our most aggressive compound. 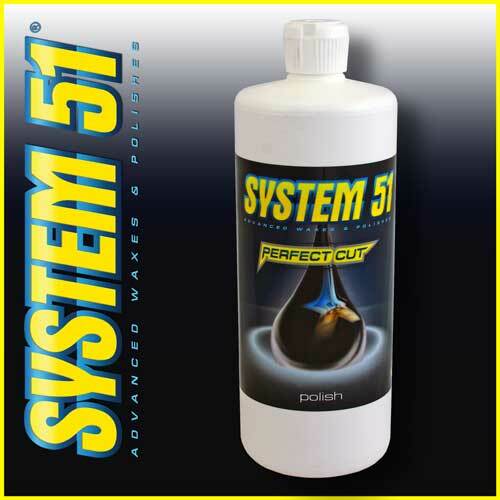 Designed with professionals in mind, Production Cut combines the System-51 waterborne technology with advanced abrasive materials. 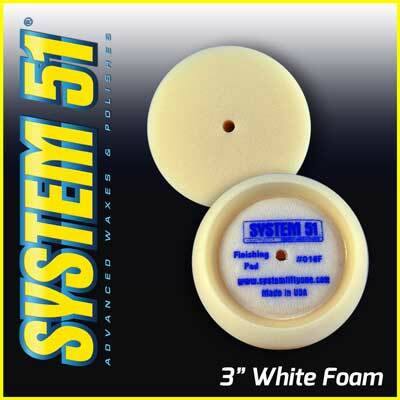 Intended for use as a heavy-cut compound, it is capable of removing 1200 grit or finer sand scratches. Safe for use with rotary and/or DA polishers. 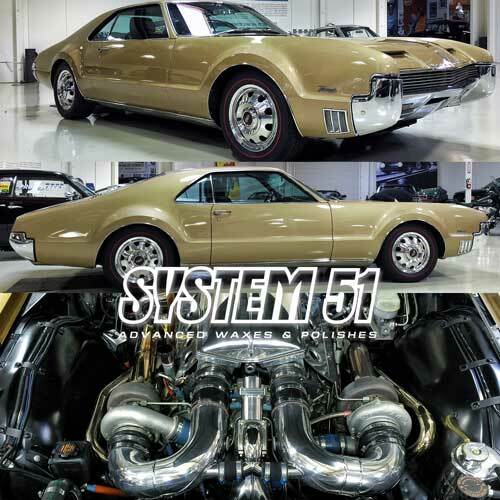 Production Cut is safe for all automotive finishes, gel coats and marine coatings. Body shop safe, will not adhere to surface or discolor trim. Pro Cut is the versatile solution for professionals and at-home enthusiasts. 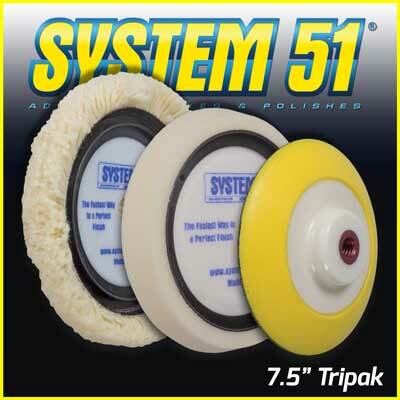 Designed to be used as a polish during the 2nd step of our 3-step process, it can also be used as a medium cut, 1st step compound depending on the demands of the job. 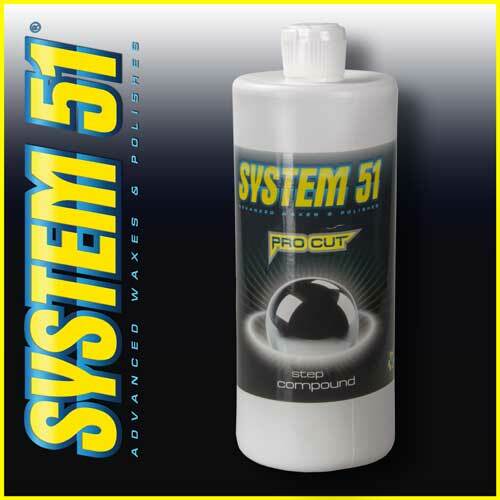 Pro Cut will remove minor imperfections and scratches as well as provide a true high-gloss finish. Does not contain any waxes, silicone or fillers. Safe for use with rotary and/or DA polishers. 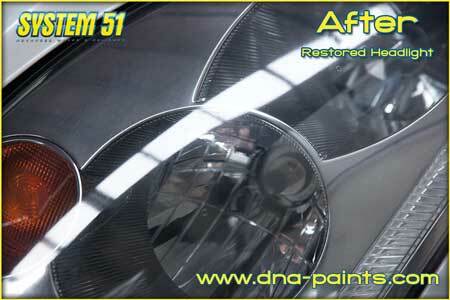 Production Cut is safe for all automotive finishes, gel coats and marine coatings. Body shop safe, will not adhere to surface or discolor trim. 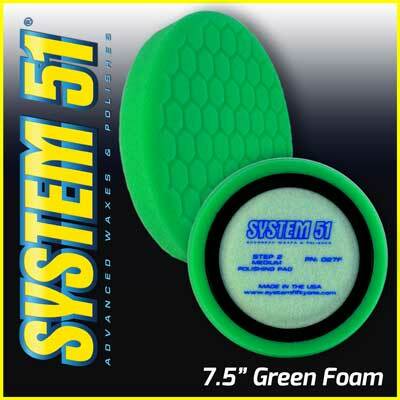 Use with green foam pad (part #027F) when polishing, or with white wool pad (part #018WW) when compounding. This is where it all started. Perfect Cut is our original formulation designed to achieve a swirl-free finish. No waxes, silicone or fillers means what you see is what you get. 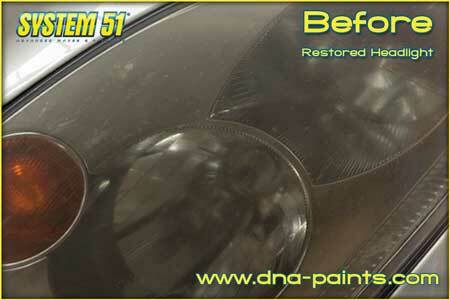 Perfect Cut will remove light pad and swirl marks as well as leave a true, high-gloss finish. Don’t be fooled, Perfect Cut is not a glaze. It eliminates the need for a glaze! Will not adhere to surface or discolor trim. 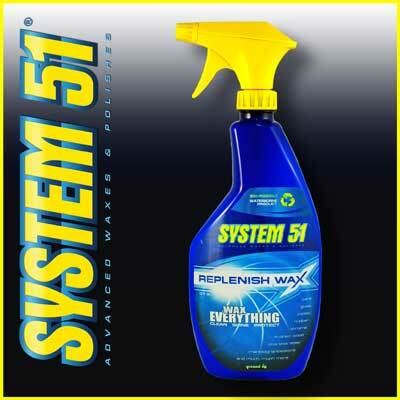 System 51’s Replenish Wax is an advanced, waterborne, spray wax that is engineered to clean and shine nearly any surface. 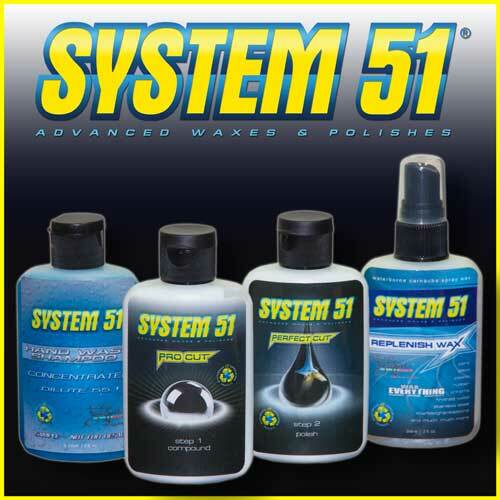 University tested and proven to help repel dust, shine longer and bring to life almost any material. 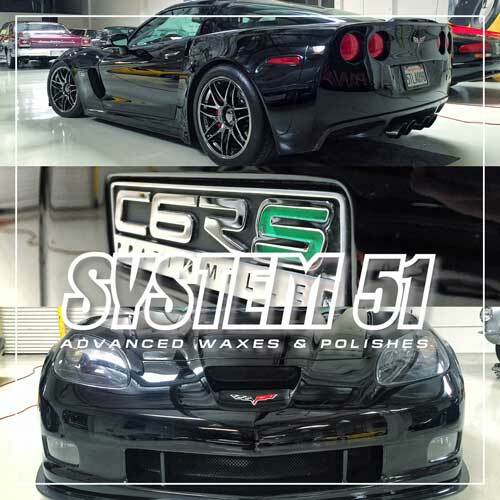 Body shop safe, this spray wax works great as a final inspection spray. Capable of cleaning & protecting glass, plastic, rubber, chrome, paint, finished wood and stainless steel. Helps remove over-spray as well as remove stains from carpet. 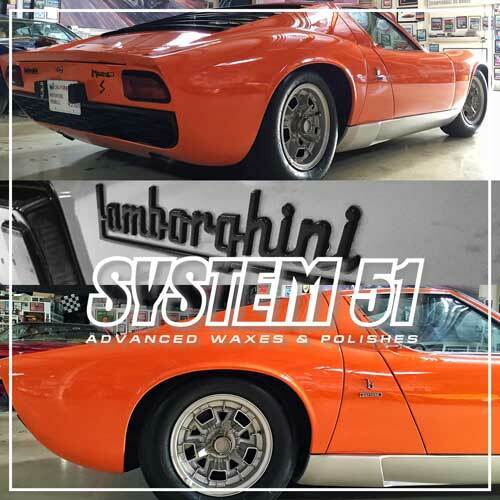 By not sealing the surface our carnauba wax formulation allows for proper curing of paint according to manufacturers’ specifications. This means it can be applied to freshly painted surfaces without any ill-effect. 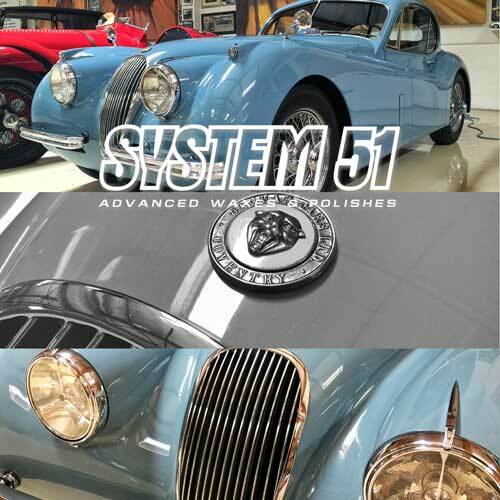 The advanced waterborne polymers allow Replenishing Wax to clean nearly every surface without staining or leaving white residue, yet still leaving 30 – 45 days of protection. 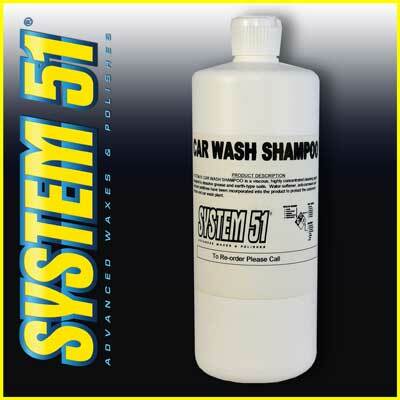 System 51’s Car Wash Shampoo is super concentrated and designed to gently lift away dirt, grime and surface contaminants. PH-balanced and 100% biodegradable, our Car Wash Shampoo will not harm your skin or the environment. 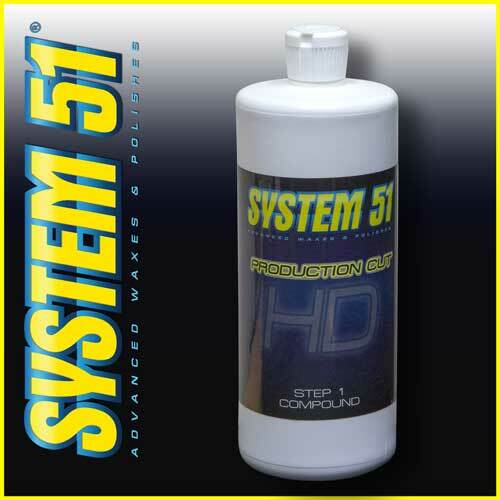 Helps reduce surface marring by providing ultra-slick lubrication. 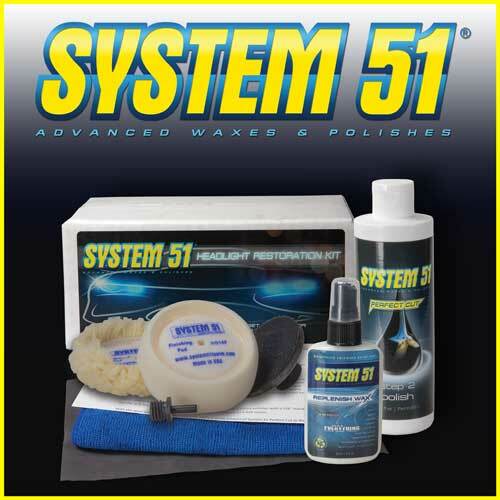 System 51 provides state-of-the-art technologies in our buffing pads as well. 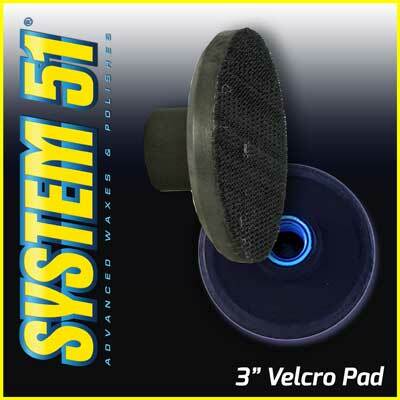 All of our pads utilize a centering ring design that helps achieve vibration-free buffing with less fatigue and better results. 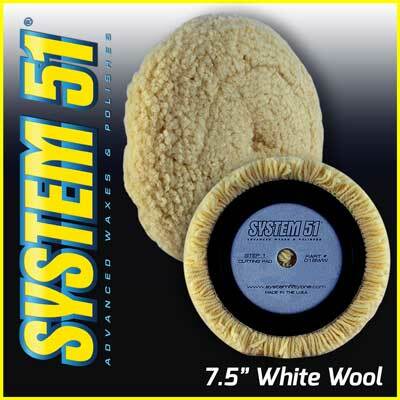 From 100% 4-ply wool, to closed and open cell foam technology, System 51 provides cutting and polishing pads to meet & exceed our customers’ expectations no matter what the job demands. 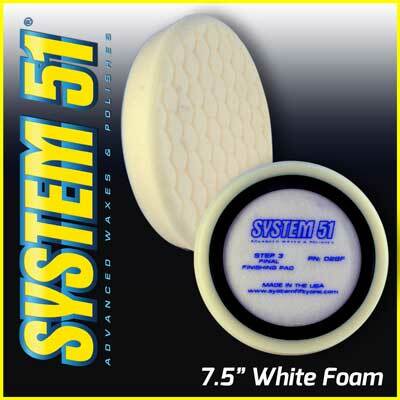 The hex-face design of our foam pads allows for efficient application of compound and polish. It also minimizes grabbing and dissipates heat faster than traditional designs. 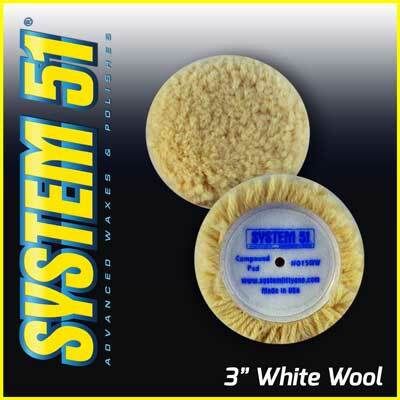 The open-cell, polyester material used in our foam polishing/finishing pads results in a softer pad that keeps surface temperatures minimized. Self-centering rings ensures vibration-free buffing. 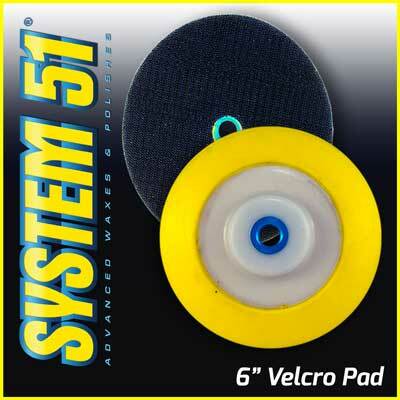 3” Velcro backing plate intended for use with 3” buffing pads (Part #’s 015WW & 016F) Can be mounted to standard polisher with M16 thread size. Use in conjunction with our drill mount adaptor (Part #017DMA) for use on a hand drill motor. 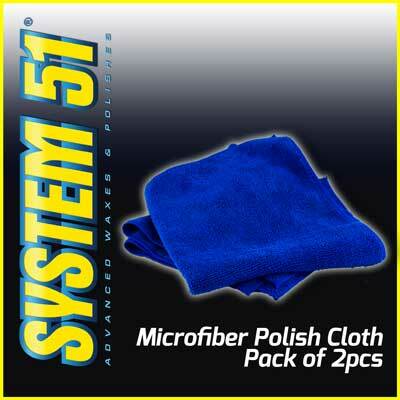 Microfibre towel 2 pack. Note that color of towel may change based on availability.